Pull a wire through an ice cube without cutting the cube! 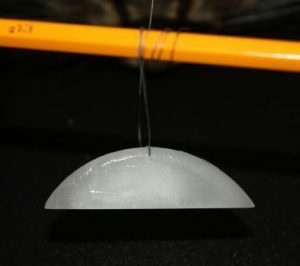 This trick works thanks to a phenomenon called regelation, in which the ice melts from the pressure of the wire and freezes up after the wire passes. Here’s how to put a wire through an ice cube or hang the ice on wire. Cut a length of fine wire. Wrap each end of the wire around a pencil to give yourself handles for the wire. Place the wire on top of an ice cube. Pull on the pencils to melt the ice below the wire. You can speed the process by applying a sawing motion to the wire. Either leave the wire partly in the ice or pull the wire all the way through the ice. As the wire passes through the ice, the cube will refreeze. The ice cube won’t be cut. In fact, you probably won’t even see the line where the wire went through the ice. An alternative is to use clear nylon fishing line instead of wire. It takes a little more pressure to melt the ice cube under the pressure of the fishing line, but you’ll get a clear ice cube on a clear line — an ice cube illusion necklace!